OT and PT put the FUN in FUNCTIONAL! Mr. Joe works on a huge variety of skills. 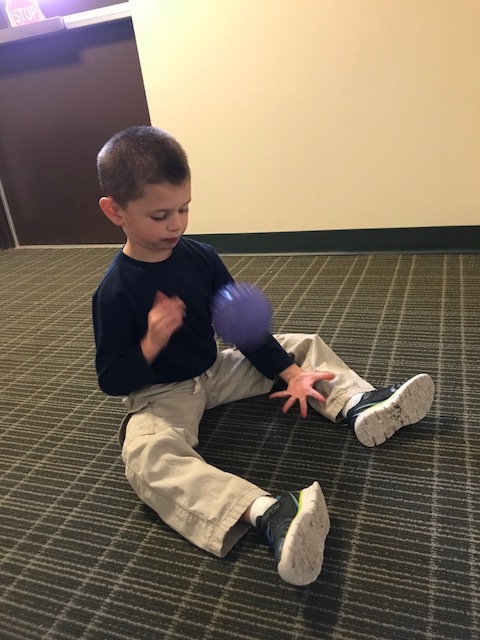 Here one of his students is doing a great job holding on during his bouncing and balancing activities! That’s a challenging but important skill for safety! Great job, Joe and M! 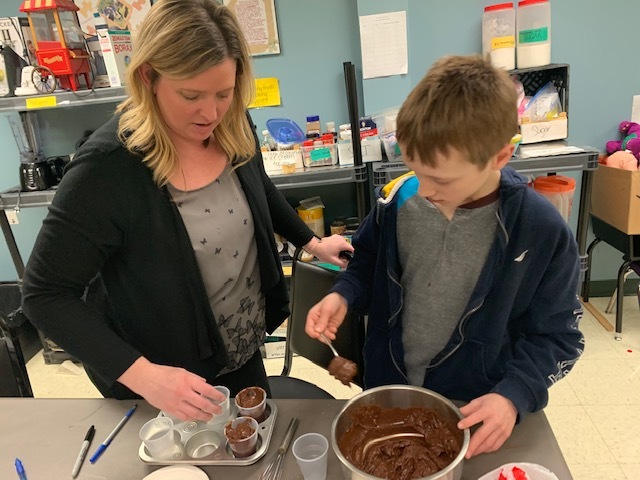 Ms. Gretchen and one of her students have been doing a great deal of food preparation and cooking this year. 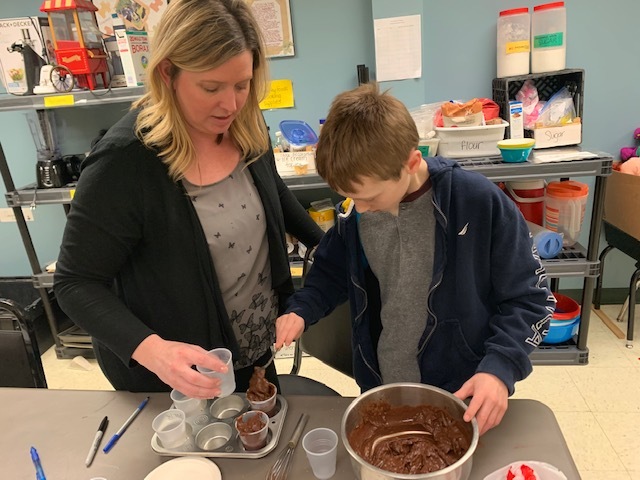 Here they are making dirt cups to welcome in the spring! The special snack will be shared with classmates later. YUM! 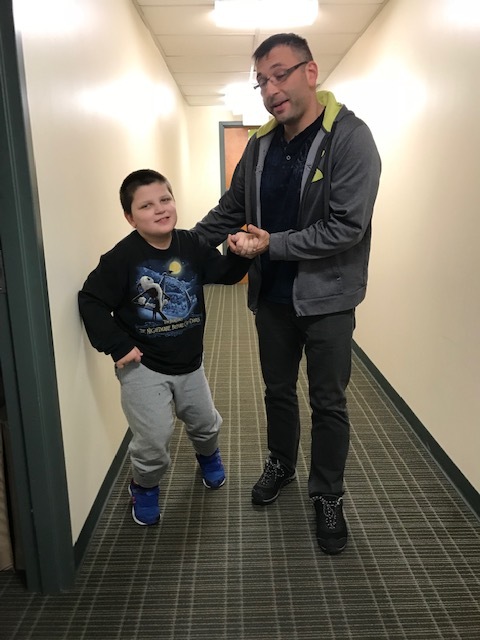 Ms. Caitlin and C are sharing a sense of humor this morning as they get ready to get down to their work! Thanks for the SMILES! Great job walking! Mr. Joe is an amazing coach! This is hard work and this young guy is up to the task. Very motivated and happy to do the work with Mr. Joe. 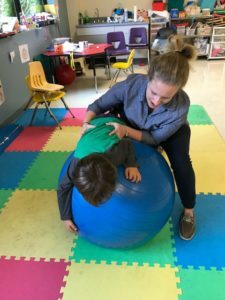 Our Physical Therapist, Mr. Joe, and our Occupational Therapists, Ms. Caitlin and Ms. Gretchen are super busy and exquisitely fun. Take a quick glimpse into the therapy room which, at Crossroads, is shared by the Occupational Therapy (O.T.) and Physical Therapy (P.T.) departments. This will give you some ideas of the types of skills that our students are making progress with here recently! One area that is often targeted for O.T. is handwriting. Handwriting isn’t a simple skill to master by any means and for some students. Prerequisite skills need to be achieved first. These can include skills such as achieving a pincer grasp, holding a utensil, and making a simple mark on a piece of paper. When a child is able to make controlled marks, such as side to side or top to bottom, then they can move on to other types of marks. Straight and curved lines, circle-like shapes, squares and triangles, and eventually letters and numbers, are later put together to form words and phrases and sentences. You’ll find the O.T.’s using everything from cheerios to silly balls to give their students practice picking up small items with fingers and utensils. So many fine motor skills are put to work in an O.T. session! 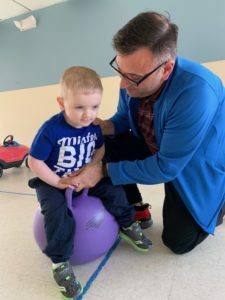 On the other side of the room, Physical Therapy works to improve gross motor skills. One of the important areas often addressed in Physical Therapy (P.T.) here is mastering the stairs. 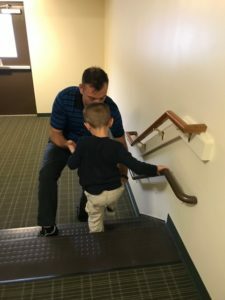 Taking one stair at a time, putting one foot up, pulling one’s own weight up with the second step, going up, going down, use of a handrail…. there are so many pieces of the full picture involved in using stairs. It’s a pretty important activity to be able to do safely and Mr. Joe makes sure that the students work hard on it! In these pictures you can also see positive reinforcement. 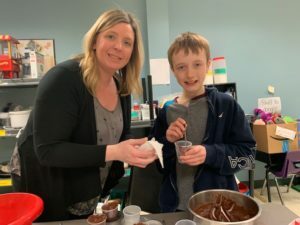 The therapists make the activities themselves very fun and reinforcing, and following successful work, they give their student an opportunity for a fun activity which is picked ahead of time by the child. 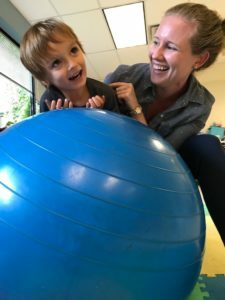 You’ll probably see that the reinforcer activities are activities which are also benefiting the child, such as the balance ball, the bouncing ball, and enthusiastic praise from the therapist. Just some of the ways that O.T. and P.T. 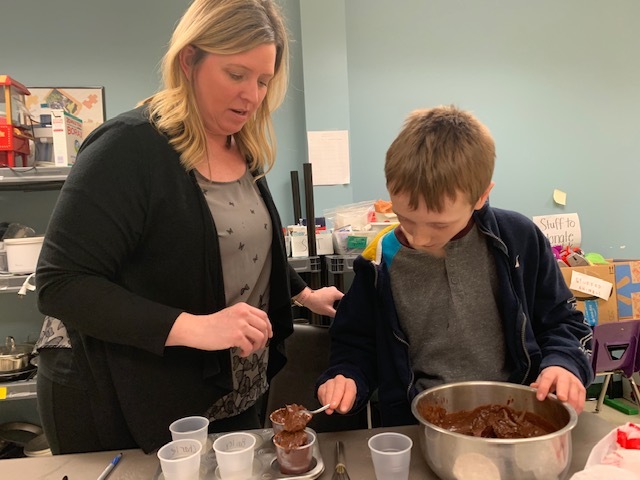 are putting the FUN in the important functional skills that they teach each day at Crossroads Center for Children! Lines are what make up letters and numbers when we write. And a line starts with a mark. 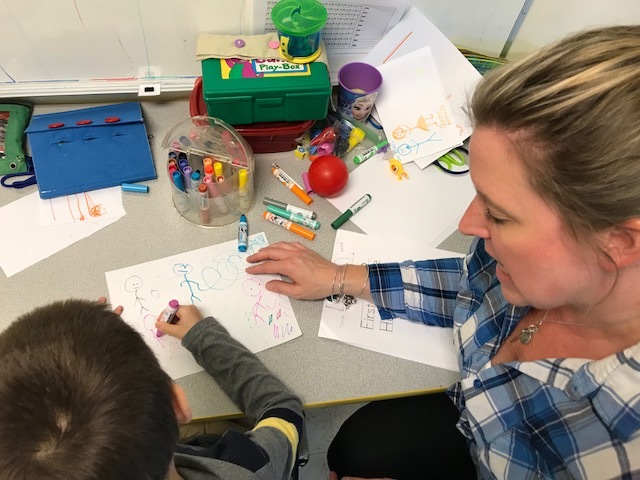 Many of the students at Crossroads are learning to draw lines, shapes, letters and numbers. Here two students work on such skills. Our Occupational Therapists are experts at helping them. Sometimes, initially, hand-over-hand assistance is needed, and that prompting can be faded out over time until the child is able demonstrate the skill more independently. It’s always wonderful to watch the development of a child’s skills. Our students work harder than many people, and it’s so exciting to see them make gains. 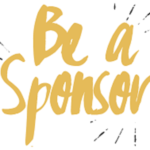 Want to help us help the kids? Please go to https://www.givegab.com/nonprofits/crossroads-center-for-children and donate today. 2016: Jump! Hop! Skip! Cut! Color! Tie! Do you remember when you took your first step? Probably not! How about when you first pincer-grasped a cheerio to pop into your mouth? No? That’s because most of us were too young to hold those memories. Most people pick up these types of developmental skills early in life, too early for us to recall. 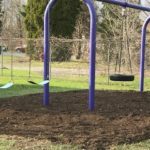 But here at Crossroads, many of our kids have delays in developmental skills. They need a little extra help to acquire them. A little encouragement, some extra practice, and voila, before you know it, those skills are solid! That’s what you’ll notice if you spend any time at all in our Occupational Therapy / Physical Therapy room. 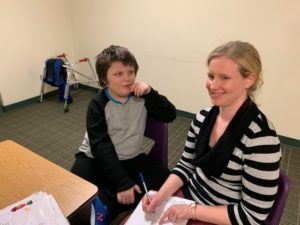 The crew works with kids throughout the building who have needs for their services in accordance with each students’ IEP (individualized education plan). So while “L” is mastering drawing a shape, “E” is tackling jumping forward. While “T” is getting becoming a whiz with zipping and unzipping a front-zipping garment, “M” is donning and doffing his own sneakers and socks with speed and precision. So much going on! So many gains! In one corner, the Occupational Therapist, (O.T.) 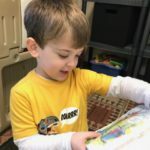 is working on self care skills with a little guy who works hard and earns the swing, his favorite positive reinforcer. He’s not alone! The swing is one of the awesome things about working hard in OT/PT! Just about everyone works hard when they know there’s this cherished prize after! In another area of the room, another student works hard at copying a square that the Occupational Therapist, (O.T.) models. Another student later in the day works a batch of putty to discover several small gems inside, something the O.T. created to help him increase his fine motor strength. He pulls out a small pink bead with delight, holding it up to share his prize. And there’s also the student who is making excellent gains with drawing requested shapes. First comes a vertical line, then horizontal. Next there’s a cross and then a circle. A square and then a triangle. The student has come far! This O.T. says the steps of each shape she requests as she is setting up the model, and the child repeats them, guiding herself with increased finesse. All the time, on the other side of the room, Joe, the Physical Therapist (P.T.) here at Crossroads, works on gross motor skills. The important skills to him are those that build balance, strength and endurance and his favorite skill to teach is using stairs, since it is so functional and life long. He relishes seeing the kids pick up the skill sometimes slowly at first but then boundless in their growth. 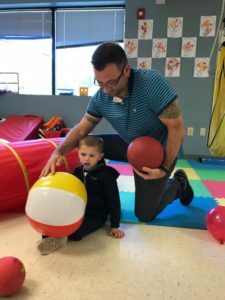 Building core strength, balance and stability is important to all of a kid’s gross body movements, and Joe’s ways of getting his students to meet goals are ingenious and fun. With Joe, students also practice skills such as catching and throwing, walking and running, jumping and hopping. Being rolled on a balance ball and sitting up on it is like a fun ride for “E” as she builds core strength and balance. Catching a ball is a fun game for “T” as she increases hand-eye coordination and aim. Jumping on a trampoline is a blast and a half for “L” as he builds lower body strength and moving balance. Climbing up a matte is a cool thing to do to get to a toy on the windowsill, as “E” and “J” build uphill inclined mobile strength and endurance. Gains and growth are observed as a child performs a skill – growth which is documented in data collection, and graphed to be analyzed for changes to the way the goal is run. 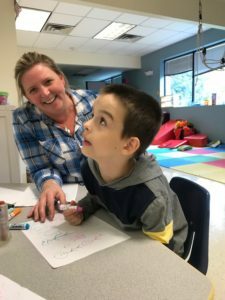 That is the crux of all programming at Crossroads – an applied behavior analysis school – and is evident as these therapists take data in the students’ binders and clipboards where steps and sets sheets are prepared ahead of time and followed not only in the therapy room but across the rest of the students’ programs as well. 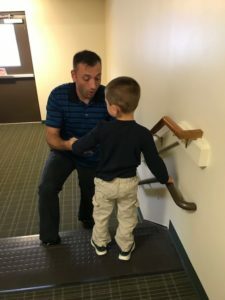 For example, a child might work on doffing at bathroom time with his classroom team, when it is a natural time to utilize that skill – our systems allow the classroom to prompt or assist the child in the same way that his OT has instructed; consistency leads to better success, and chances for generalization to new environments. 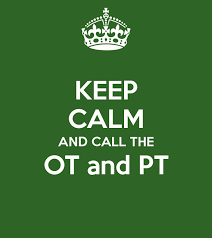 Our students love going to OT and PT and make excellent gains because of our phenomenal therapists. 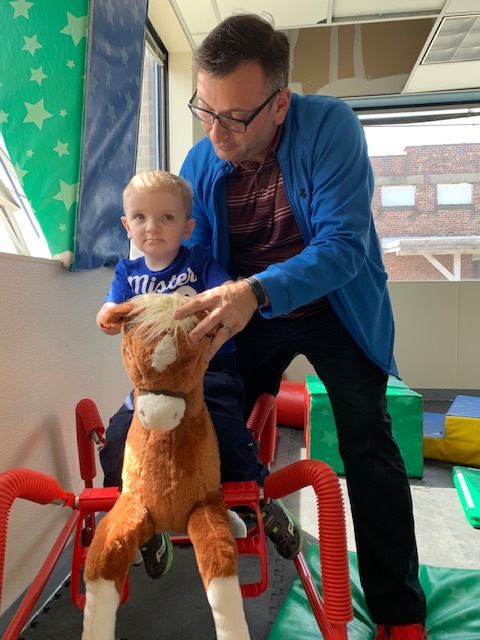 Thank you for all of your work and devotion to the children of Crossroads Center for Children. 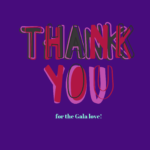 Gala SAVE-the-DATE and SPONSORSHIP forms.Who, what, where and why and other GALA FAQ’s you are wondering.